You can configure Secure Print Release on a device, that is, a user needs to authenticate at the device before the job is printed. Select the physical queue for the device. 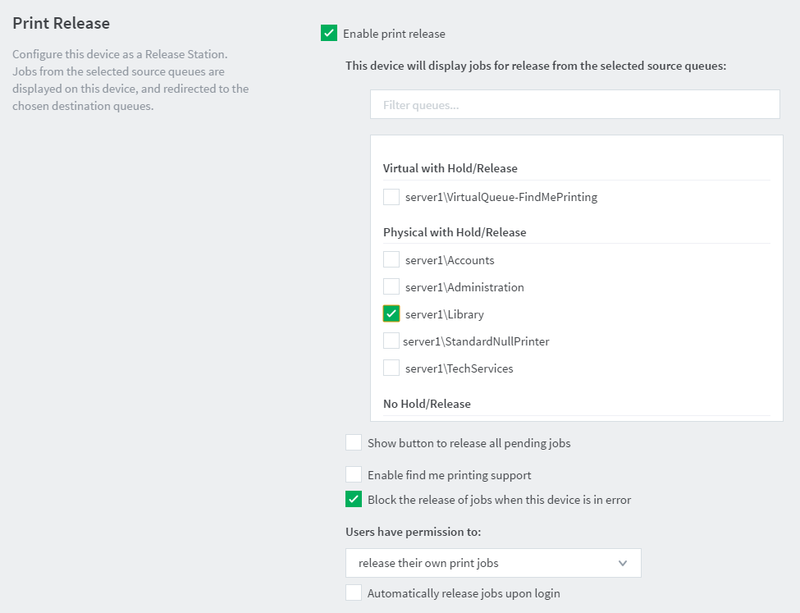 In This device will display jobs for release from the selected source queues, select the physical queues pointing to the device you are configuring. You might, for example, have multiple queues for a single device if you have a color print queue and a grayscale print queue. Suggested—queues are suggested if they are Hold/Release queues and have the same IP address as the current device. IP matching can be either an exact match on the IP address or a match using hostname resolution. configure Find Me printing by selecting at least one destination queue. You can filter the list of source queues to display only those queues with a specific text string in the queue name.